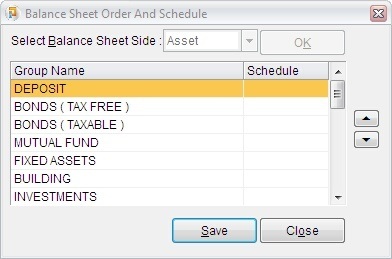 Through this option you can decide the order in which the various account heads should be displayed in the Balance Sheet. This module has columns like [Group Name and Order] and [Schedule] Select the group for which you want to shift the position in your Balance Sheet report and use [UP] and [Down] arrow keys to put the selected group in the desired order. If you want to make any group as schedule put any character in [Schedule], this will not display all accounts under the same group in the balance sheet, but create a separate list as schedule. Click Save to carry out the necessary changes.